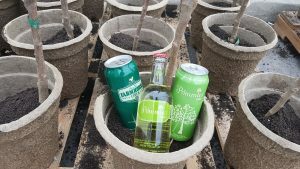 PRESS RELEASE: POMMIES CIDER 6th ANNUAL APPLE TREE GIVEAWAY TO KICK-OFF END OF APRIL » Pommies Cider Co.
(Toronto, ON – April 10, 2018) Pommies Cider Co. is returning for year six of their Pommies Apple Tree Giveaway. Starting April 27, Pommies will be at select LCBO locations sampling both their Original and Farmhouse ciders. Consumers who purchase 12 bottles or cans of Pommies Original Cider and/or Pommies Farmhouse Cider will leave the store with a gala apple tree. To date, Pommies and the LCBO have given away over 700 apple trees, which have been planted across Ontario. The campaign not only emphasizes the fact that Pommies ciders are natural products made from 100% local Ontario apples, but it shows just how well apples grow in Ontario and the benefits of buying local. Bolton LCBO (30 McEwan Drive E) – Friday April 27, 4 p.m. – 8 p.m.
Orangeville LCBO (40 Broadway) – Friday April 27, 4 p.m. – 8 p.m.
Caledon East LCBO (16000 Airport Road) – Saturday April 28, 1 p.m. – 5 p.m.
Ancaster LCBO (737 Golf Links Road) – Friday May 4, 4 p.m. – 8 p.m.
Guelph LCBO (16 Wellington St W) – Friday May 4, 4 p.m. – 8 p.m.
Fergus LCBO (97 Parkside Drive W) – Saturday May 5, 1 p.m. – 5 p.m.
Oakville LCBO (251 Oak Walk Drive) – Friday May 11, 4 p.m. – 8 p.m.
Waterloo LCBO (115 King Street S) – Saturday May 12, 11:30 a.m. – 3:30 p.m. The heritage gala apple trees that will be given away at each location are approximately three feet tall and one year old. These dwarf variety trees will not exceed a height of eight-feet tall when fully grown. Detailed planting and growing instructions will be provided with each tree. Pommies Cider and Pommies Farmhouse Cider are produced in Caledon, Ontario, and are made from the juice of 100 per cent Ontario apples. They are both gluten free, GMO free, vegan, and contain no artificial flavours or colours and are never made from concentrate. Pommies Cider is sold in unique 355 ml bottles in packs of four for $13.50 and in 473 ml cans for $3.25. Pommies Farmhouse is sold in 473 ml cans for $3.25. Consumers can go to LCBO.com to find LCBO locations carrying Pommies ciders. Find us online at pommies.com, Facebook /pommiescider, Twitter @pommiescider and Instagram pommiescider. Brittany Tougher, Pommies Cider Co.